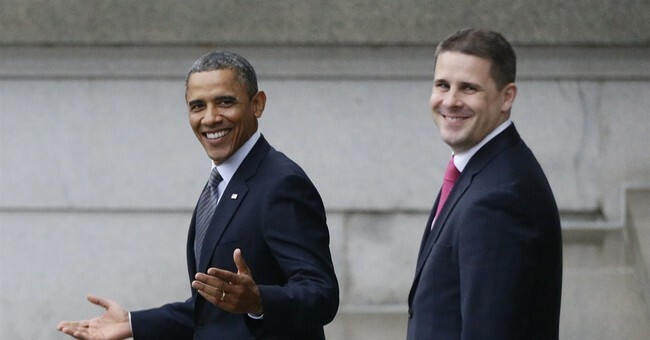 White House senior adviser Dan Pfeiffer likened House Republicans to suicide bombers, kidnappers and arsonists in a single interview on Thursday. "What we're not for is negotiating with people with a bomb strapped to their chest," Pfeiffer told CNN's Jake Tapper in laying out the president's refusal to compromise with the GOP to win an increase in the nation's debt limit. "We're not going to do that." The White House position, increasingly fortified with high voltage rhetoric, has been that Republicans should agree to a hike without any strings attached. If the cap isn't lifted by Oct. 17, according to the Treasury Department, the nation will default on its debt. Pfeiffer also offered up analogies comparing Republicans to kidnappers and arsonists. Other Democrats quickly jumped on the 'new tone' bandwagon, with outgoing Iowa Senator Tom Harkin blathering about the Civil War, and Sen. Barbara Mikulski ranting against "tea-baggers" -- in the process of concern trolling about preserving the character of the "world's most deliberative body," of course. Nice work. The White House's rhetoric reaches a fevered pitch on the debt ceiling, an issue over which Obama says he won't even sit down to negotiate. The administration's squealing may betray the fact that they realize the deck is stacked against O on this one. As a Senator, he voted against increasing the debt limit along with every single one of his Democratic colleagues. The American people expect compromise and overwhelmingly disagree with his insistence on another "clean," no-strings debt limit hike. Beyond that, consider the newly-revealed fact that the president is courting Iran's Jew-hating, dissident slaughtering, anti-American regime to discuss its illegal nuclear program. An obvious juxtaposition arises: Obama will offer to sit down and talk with Khamenei's puppet (and get snubbed), but he won't sit down with John Boehner to hammer out some reforms and cuts in exchange for Congress authorizing trillions in new federal borrowing? What optics. Meanwhile, Obama's mouthpieces are out there screaming about Republicans being terroristic pyromaniac kidnappers, or whatever? Good luck convincing the public that you're the reasonable one with that approach, champ.